This is another great skill game in which you will have to help the red ball travel the lands in the search of his greatest treasure. He is the king of the land but one day he went outside for a roll, when suddenly a great wind started blowing and it took his crown away. Start the search for it in these great levels filled with adventure and traps. There are a lot of things that can pop you but you have to try to avoid them as spikes can easily tear a hole in you. Also falling from those heights isnt what you call comfortable so that will cost you lives also. Try your best to recover the crown and you will be rewarded. 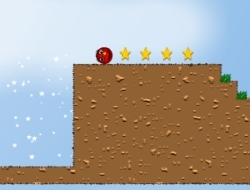 Use the arrow keys to move and jump, press down to make the ball stop. Red Ball 2 0.00 between 0 and 10 based on 0 votes.